First, find a frame you think will look good as sunglasses. This is a style from the MySpex RGE Collection. Tip 3. Frame Material - Choose any frame material you like. TR90 and Ultem are very lightweight and durable. Plastic frames in general fit closer to your face than frames with nose pads and that can help with light and glare coming through the sides of the glasses. Tip 4. Frame Color - Classic sunglass frame colors are typically dark. Black, Brown, Gunmetal, Tortoise, etc... But the color world is your oyster. Choose whatever you want! 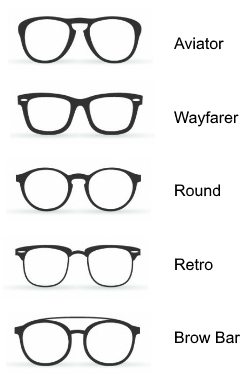 Next, Lens Types and Lens Options - What type of lens do you want? How to buy: Shop for any full-rimmed frame. Choose Plano Lenses. Choose your lens option. How to buy: Shop for any frame. Choose Reader Lenses. Choose your Right and Left reading powers. Choose your lens option. Bifocal Sun Lenses - Lined Bifocals or Line Free Progressive Reader Lenses. Zero power top/ Reading power bottom. A great reader option for large sized frames. How to buy: Shop for any frame. Choose the Bifocal Lenses you want. Choose your reading power. Choose your lens option. How to buy: Shop for any full-rimmed frame. Choose Prescription Lenses. Choose your Rx Type. Choose your lens option. Upload your prescription and PD. Special Rx Lenses - Our special prescription lenses consist of single vision lenses that address high prescriptions as well as Progressive lenses. These lenses and options are not available on the frame page. You add a frame to your cart without the lenses or options. Then you select your lens and the lens options. Special Prescription Sun Lens Options depend on the lens you choose. Options include Mojo BluBlock Tints, Transitions VII, Transitions EXTRActive, Transitions Vantage Polar, Transitions DriveWear, and Xperio Polarized. How to buy: Shop for any full-rimmed frame. Add the frame without any lenses to your cart. Go to the Rx page and select your lens. On the lens page, select your options and add the lenses to your cart.